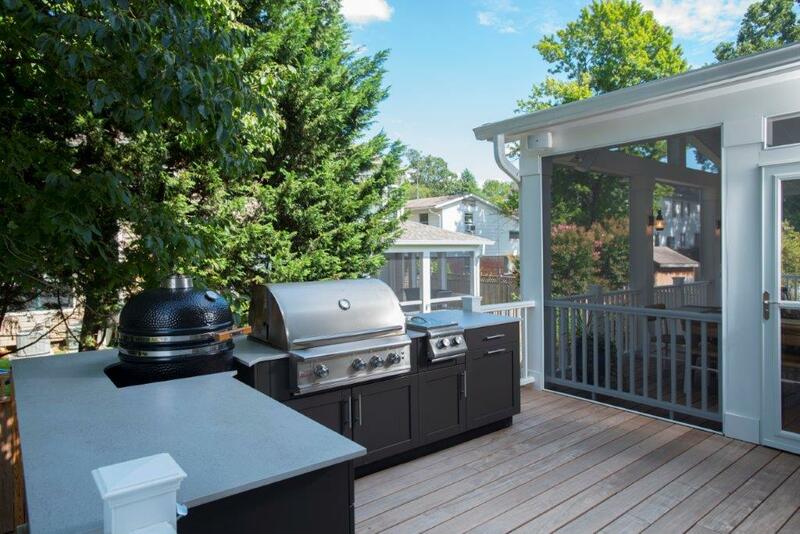 If you’re looking into adding a new outdoor living space to your home, it’s important to know some of the ways those outdoor spaces have changed in the past ten to twenty years. One of the biggest shifts in that regard is with expectation of quality. When it comes to outdoor kitchen cabinetry, products can now approximate the look and quality of indoor items. Danver Stainless Outdoor Kitchens is one of the brands leading the way in this industry sector. Danver Cabinets specializes in 100% stainless steel outdoor kitchen cabinetry, an industry they've been in for approximately 15 years. Their products are made to order and are produced entirely in the United States. Because there are so many variations in cabinet size, coloring, and design, nothing sits on the shelf in the back of a factory. Rather, when an order comes in, it is custom made. Danver uses a grade 304 stainless steel. This is American-made and is the highest grade of stainless steel available. If your kitchen requires it, a 316 marine grade stainless steel is also available. The thickness is a sixteen gauge, which is fairly standard. Thicker gauges are available, but they are heavier and not necessarily superior. Danver cabinets come in sizes ranging from 9” to 48”, and they are offered in three-inch increments. However, if your outdoor kitchen calls for a specific size that doesn’t align with those three-inch increments, Danver also offers fillers down to one inch. These fillers allows for nearly any custom layout to be accommodated. If size is ever an issue, the fillers are an excellent, seamless way to fill in those gaps. One of the largest advantages of Danver cabinets is their versatility and compatibility. They fit with any manufacturer’s appliances, so if you already have a grill in place or one in mind, that’s not a problem. Danver has a custom cabinet to fit any existing piece (or pieces) of the outdoor kitchen. Whether you have side burners, bartending stations, grills, or any combination thereof, getting Danver cabinets to fit is not an issue. 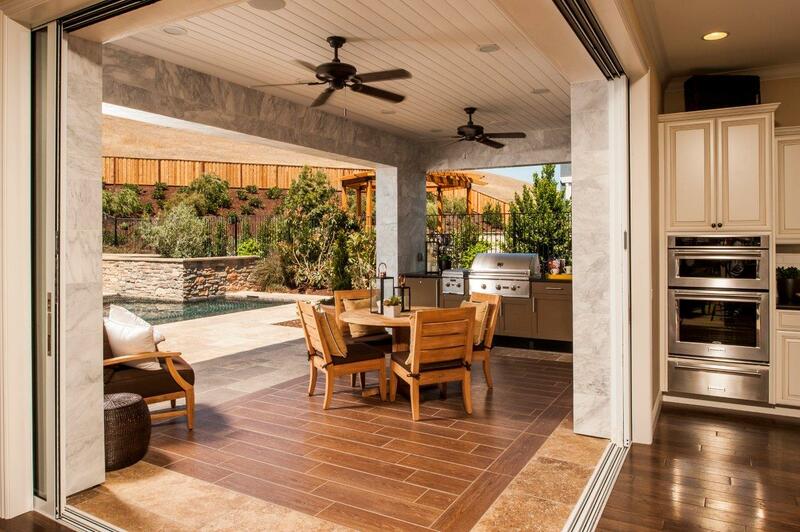 Stainless steel outdoor kitchen integrated into the indoor living space with a little design innovation. Used with permission from Danver Cabinets. While many wood, composite, or synthetic cabinets require maintenance and upkeep, stainless steel cabinets have no such obligation. If the appearance of fingerprints is not desired, the stainless steel can always be powder coated to eliminate this issue. Powder coating is often also suggested when the cabinetry is near water sources or pools. Even without routine maintenance, Danver cabinets will hold up better than plastics, composites, or natural wood. They won’t be subject to expanding, warping, or cracking like you might see with other materials. Especially in extreme weather, composites are often going to bulge and lose their shape, and that’s not the case with stainless steel. Danver cabinets have a host of high-end features. In addition to the quality of stainless steel used, they also use soft close doors and drawers. The drawers are all full extension with undermount glides, so they aren’t exposed to the elements. The style is predominantly a European frameless cabinet, which gives you a cleaner look and more space after opening the door. Danver is also the only company to offer five-piece doors. With immaculately rounded edges and quality touches, the doors are often viewed as the selling point of the entire cabinet system. The cabinets come with a lifetime warranty, and the powder coating comes with a seven-year limited warranty. Danver strives to make outdoor kitchens as high-end as interior kitchens in terms of color, style, and design. Coupled with the quality of cabinets, Danver is largely considered the industry gold standard. They also offer more convenience, as install can be done in a single day. This is as opposed to stone, where dusty, disruptive, expensive labor can go on for weeks.